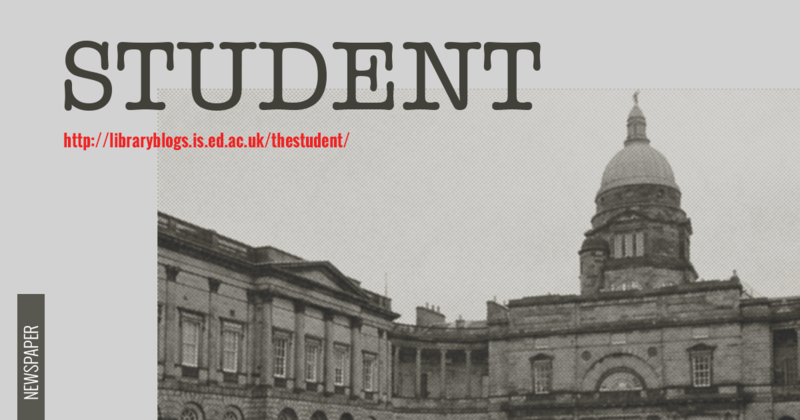 Home » Collections » Student newspaper digitisation project returns! Student newspaper digitisation project returns! In 2014, the Library ran a pilot project to digitise copies of The Student newspaper from the academic year 1984 / 1985. The papers were released in real-time, exactly 30 years after they were first published, and provided an interesting insight into life as a student in Edinburgh in the mid 1980s. Now, thanks to a generous grant from the Alumni Innovation Initiative, we are able to continue the project, starting from the point at which the pilot ended in summer 1985. Second Year History student Olivia Nolan will be working with us part time from November until April – we’re delighted to have her on board! As before, we’d be really keen to hear from you about your experiences of living in Edinburgh and studying or working at the University in the 1980s. We’ll be posting on the Centre for Research Collections’ Facebook page and tweeting from its Twitter account using the hashtag #studentarchive. Please join in!